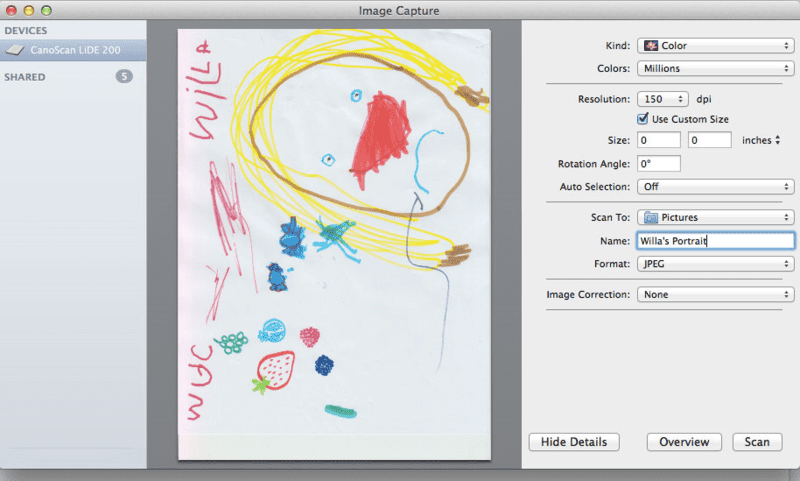 First, you’ll want to make a digital file of your artwork by scanning the picture. 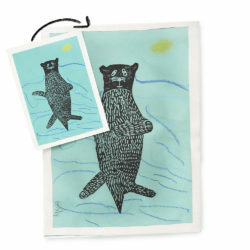 You’ll want to give your file a descriptive name, and since Spoonflower prints at 150 dpi, I’ll save at this resolution. 2. 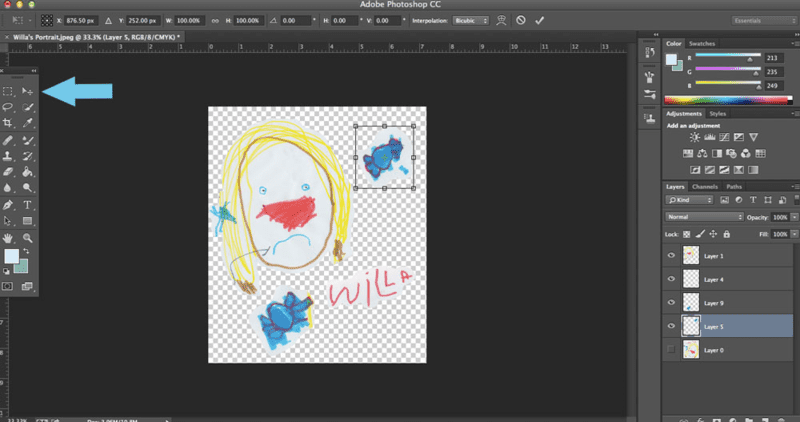 Open your file in Photoshop and crop to your desired area. I’m using Photoshop to clean up the artwork and isolate single elements from the whole drawing that I’ll use to create a new pattern. 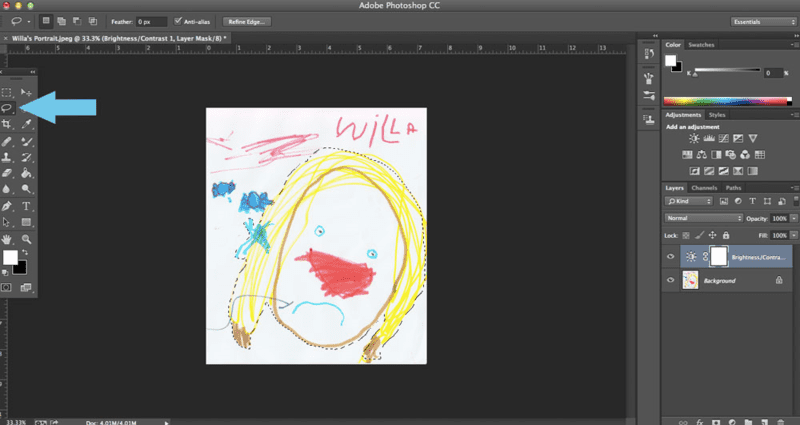 Since I also did a little scribbling on this piece of paper, I’ll use the crop tool to focus only on Willa’s lovely portrait. Depending on how thick or heavy the lines in your drawing, you may want to adjust the contrast in your image. This will make cleaning up the drawing a bit easier, since next we are going to pick out individual objects. 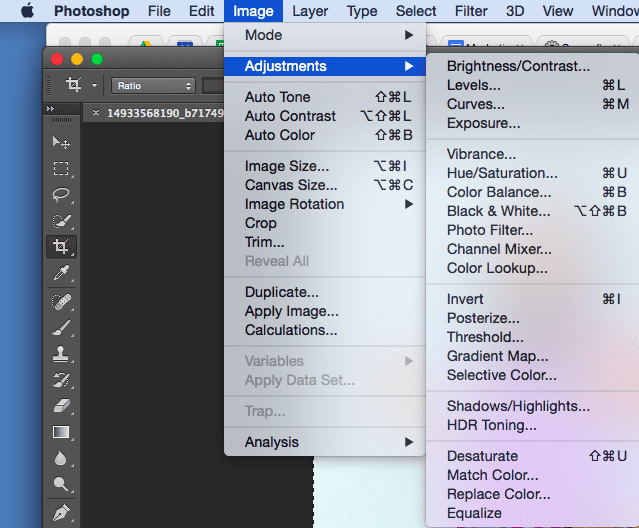 To adjust the contrast, navigate to “Image” in the top navigation of Photoshop and select “Adjustments,” then Brightness/Contrast. Play around with the contrast using the tool in the pop up window until you like what you see. At this point you’re just trying to highlight design elements and eliminate some of the background to make cleaning up your file easier. 4. Use the lasso tool to grab individual elements and add them to new layers. 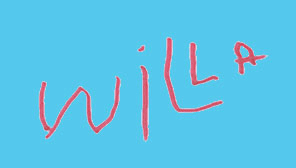 For this design, I plan to take pieces of Willa’s drawing and create a new arrangement for a repeating pattern. 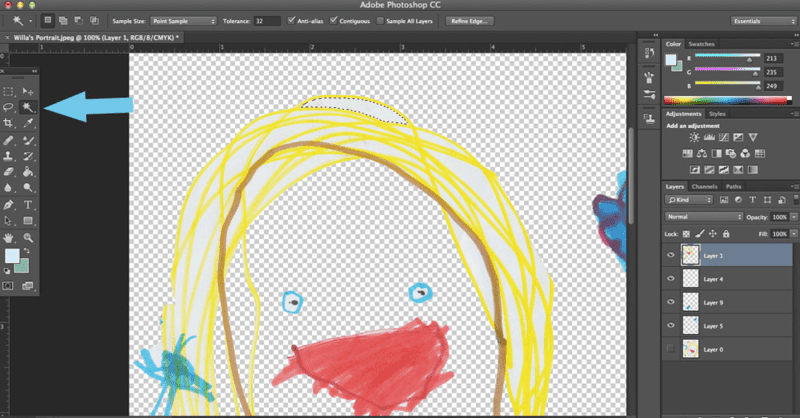 I’ll use the lasso tool to outline individual elements, and I’ll cut and paste each into a new layer. To copy and paste, you can use Ctrl + X (Windows) or Cmd + X (Mac) to cut and Ctrl + V (Windows) or Cmd + V (Mac) to paste. This will create a separate layer for each element allowing for easier manipulation. 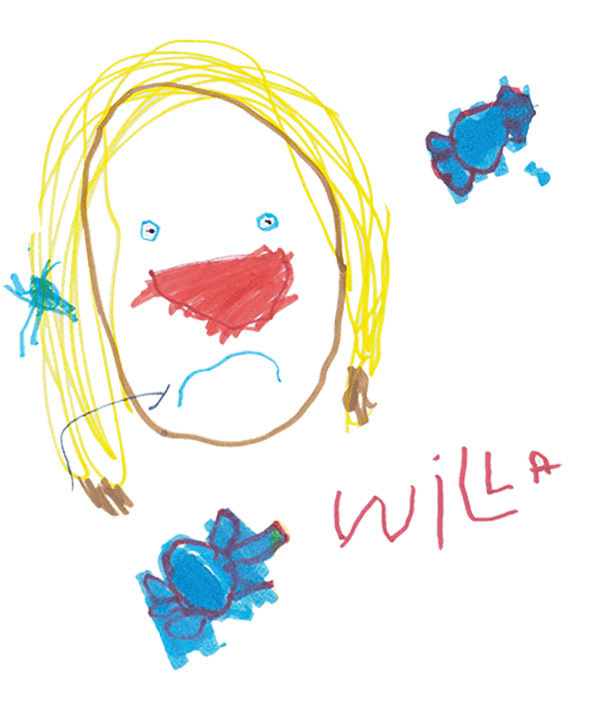 From Willa’s drawing, I’m going to select her lovely face, the two pieces of candy up in the left-hand corner, and her signature. 5. Lay out your design. With your elements in different layers, select the layer you’d like to move, and rearrange until your heart is content. Select the arrow in your tool bar and you will be able to move elements independently. You can also transform designs, making them larger or smaller with the simple keyboard command Ctrl + T (Windows) or Cmd + T (Mac). When the box appears around and element, use the corners or sides to resize. 6. Clean up your edges with the magic wand. 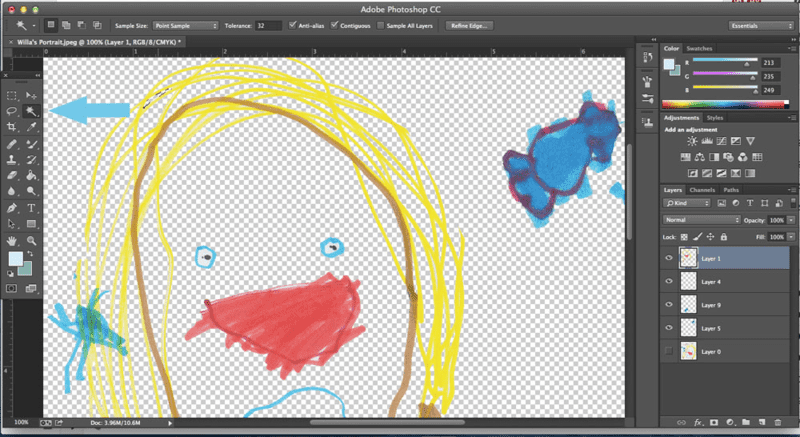 Now that I have my design the way I like it, I am going to use the magic wand tool to clean up the background. Did you notice in Step 5 how each element looked as if it had been cut and pasted on the background from paper? 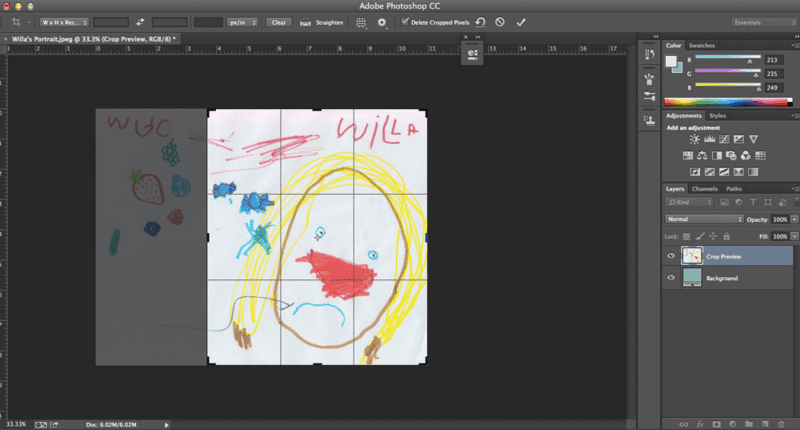 The magic wand tool will allow us to clean up these edges so all elements appear on a seamless, clear background. Since I’ve upped the contrast on my design and Willa’s lines are not too close together, this just requires selecting an area with the magic wand and hitting “delete” to clear the area. 7. Play around as much as you like, and then save your files! Once you’ve laid out a design or 3(!) how you’d like them, you’re ready to save our file in Photoshop. 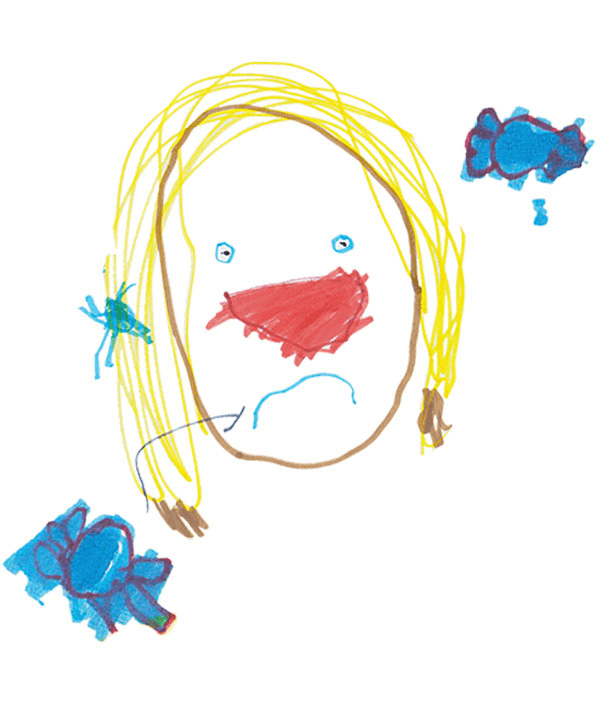 I saved three different files from my original drawing, one portrait with a signature, one without, and then a coordinate that only features the signature on a blue background. I saved my files as JPEGs for uploading to Spoonflower. 8. 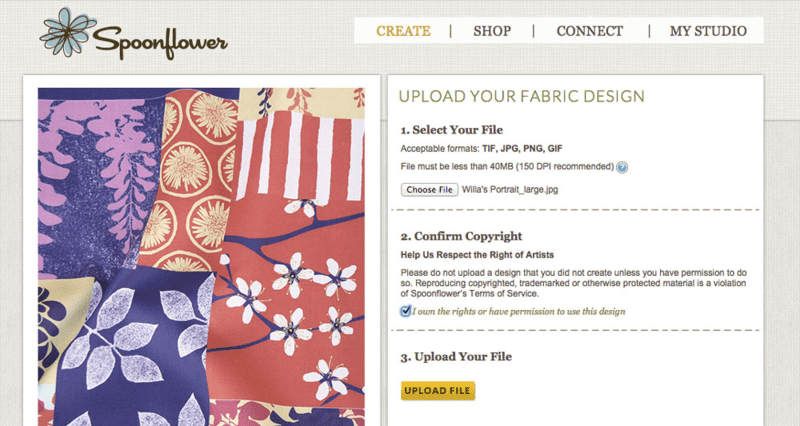 Upload your file to Spoonflower. 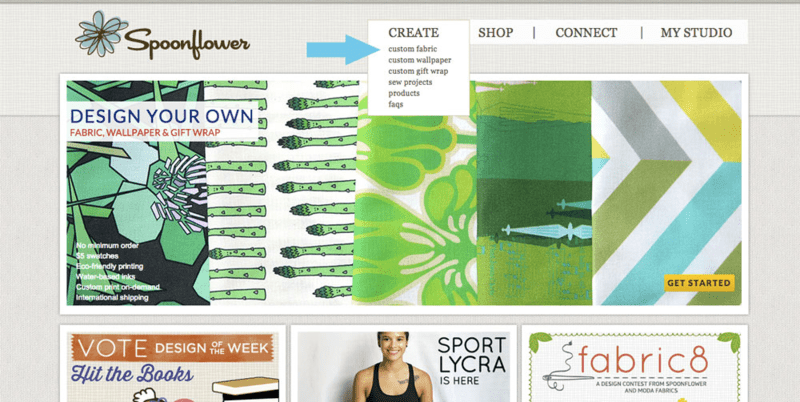 Head over to Spoonflower to upload your design. Sign into your account (if you don’t have one yet, create one here, it’s free and easy! ), and navigate to “Create” and select “custom fabric” in the dropdown menu. 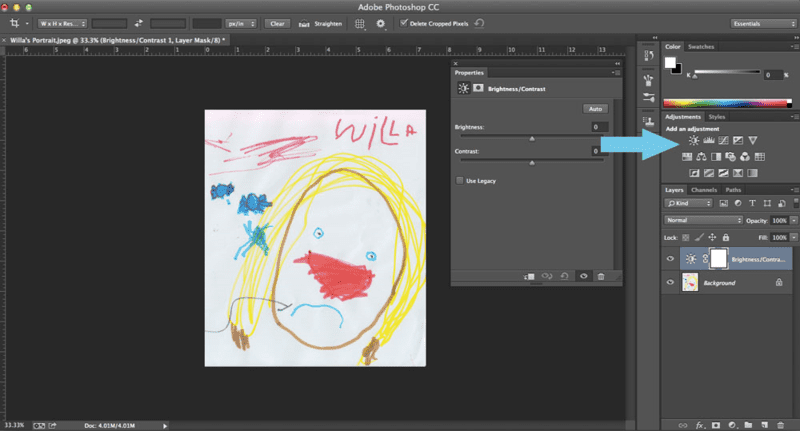 Now select your file, verify that this is your original work, and upload your image! 9. Select your repeat, save your layout, and order your fabric! Play around with the repeat options and the size of your design, then save the layout you like. When you’re happy with your preview, select a fabric, specify the amount of fabric that you need for a project, and you’re ready to add that to your cart! I ordered a fat quarter of each design I created. 10. 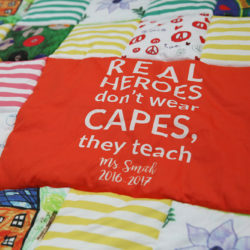 Once you have your fabric, create something beautifully personalized! Celebrate when you see how your fabric turns out, and choose a project to make! 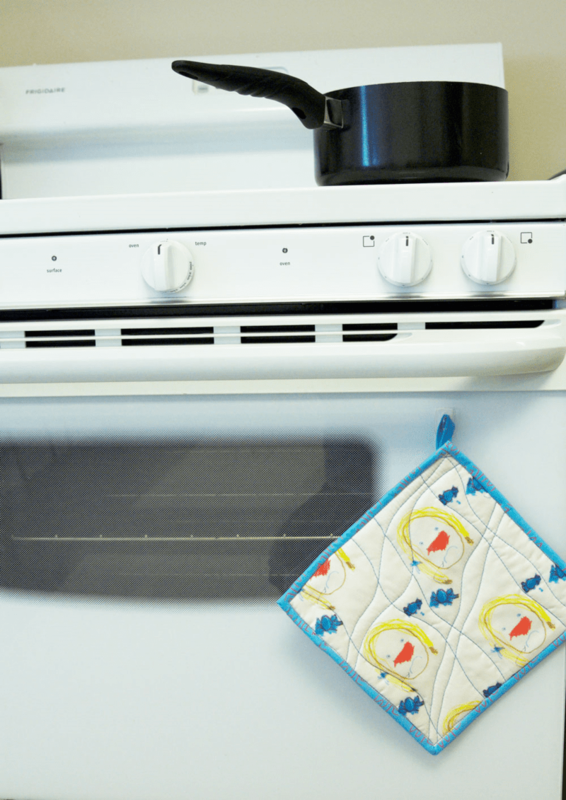 I chose a simple, quilted potholder that came together in no time and will be a lovely way to showcase the handiwork of my favorite sous chef! 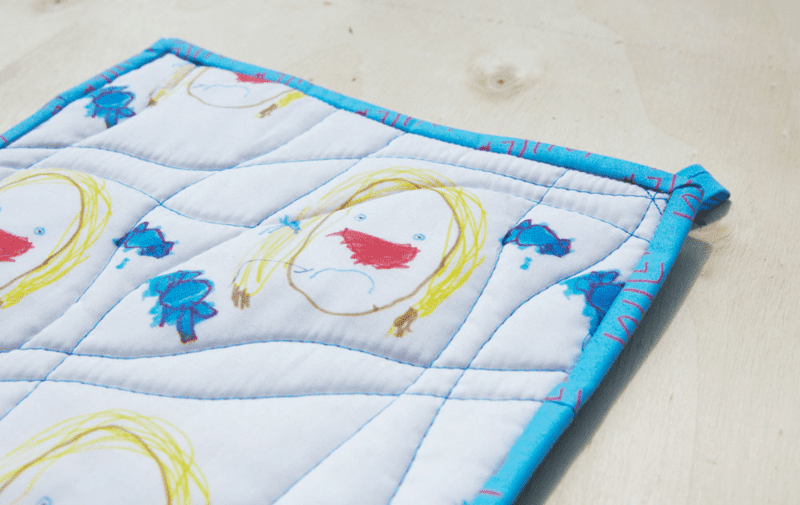 For more projects like this, check out The Spoonflower Handbook! 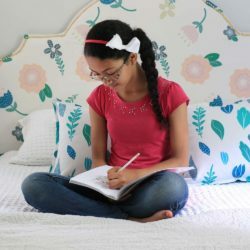 Our very first book features over 30 DIY projects to get you started designing your own fabric, wallpaper and gift wrap! I have been thinking about this DIY for sometime now and have stacked several artworks already but can’t find time to start. Thank you for this post and for the tips! Awesome! Hi Stef! We are so glad you like the post and find the tips helpful! I totally understand the need to find time, and this is definitely a project that can be broken down into little steps and picked up at your convenience, just save your work as you go. Happy designing––we can’t wait to see what you create! 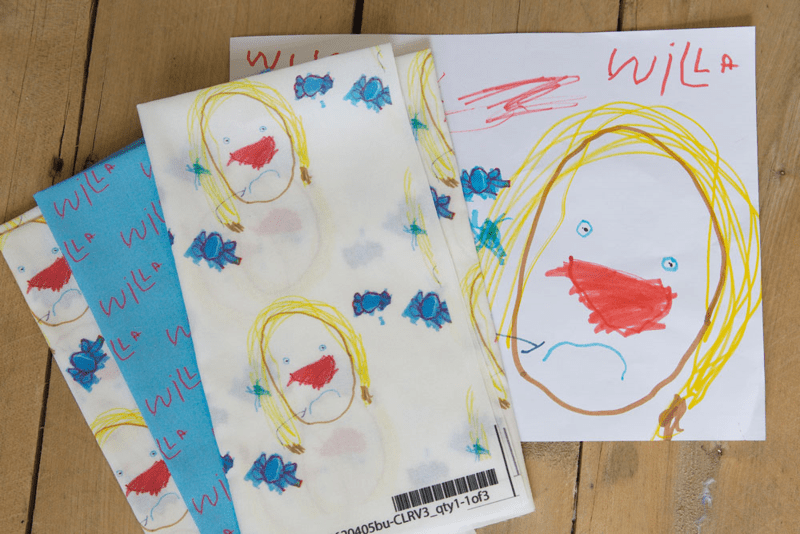 Great idea, now to decide which artwork to use though. Makes sense that if we don’t trim out the white from the graphic then we will end up with a print that doesn’t look as neat and commercial. Seems like this would work just as well for a company or sports team logo, lots of possibilities. Postage costs are completely reasonable to Australia too. Thank you, well done.